Display your plants with Sorbus Macrame Hanging Planters. Beautifully suspend potted plants and flowers with bohemian inspired plant hangers. 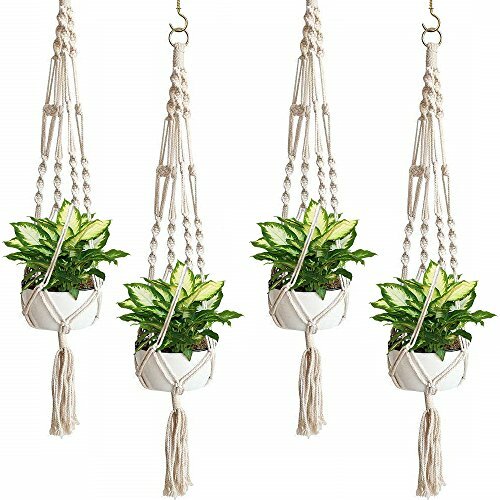 Ideal for home and garden lovers, this set of hanging plant holders feature a meticulous macramé rope twist design with tassels and hanging hooks. They hold a variety of flower pot shapes and sizes, whether round or square. Simply add your favorite spider plants, faux flowers, succulents, air plants, and more. Hang from your ceiling or wall of choice to keeps plants off the ground and away from pets and children. With a stylish plant display, you'll add character, purify the air, and bring positivity to your home, garden, or patio. Perfect for indoor/outdoor plant décor. Indoors, display your favorite houseplants near a sunny window, kitchen, bathroom, living room, bedroom, office, terrarium display, and more. Outdoors, showcase your green thumb with a well-curated display of spider plants inside terra cotta pots. Hang around your patio, porch, balcony, rooftop, terrace, and more for a breathtaking display. These macramé plant hangers also make a great gift for any bridal shower, housewarming, baby shower, mother's day, or birthday gift. Sturdy elegant design holds a variety of pot sizes.